Exceptional studio with large balconny on the 5th floor overlooking the Canal St Martin. Totally refurbished and very fuctional. Spacious living room with convertible sofa, open kitchen and a desk with chairs. Large closet space at the entrance. Bathroom with walk-in shower, sink, WC & washing machine. Located on Quai de Jemmpaes in the trendy Canal St Martin area with caf�s, restaurants and fashion shops. City bike stations in the neighbourhood and a few minuts walk to Place de la Republique with 5 metro lines. The apartment is located right next to the Canal St Martin on Quai de Jemmapes in the 10th arrondissement. Still navigated this days, the canal St Martin is one of the most popular & trendy areas of Paris today - with lovely walks all along the canal. Like the other Paris canals (St Denis and Ourcq), the 4.5 km St Martin Canal was built by order of Napoleon I between 1806 and 1825. The traffic is not heavy, the canal is maintly used by passanger river boats taking off at Port de l'Arsenal near Place de la Bastille. The Canal St Martin area is full of trendy caf�s, restaurants and fasion boutiques. 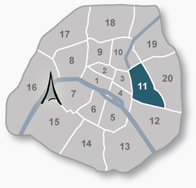 Place de la R�publique and Le Marais is just a 10 min walk from the apartment. Supermarkets and all kinds of stores in the neighbourhood. Spacious living room with large glasdoors opening up to the balconny. Convertible sofa, coffee table and desk with chairs. Two closets with sliding doors at the entrance. Large balconny facing the Canal St Martin with beautiful views. Fully equipped kitchen with vitro-ceramic stovetop, microwave, coffee machine, dishwasher and refridgerator. The kitchen is open to the living room and could be closed with two large doors. Spacious bathroom with large walk-in shower, sink, WC, washing machine and several closets. Entrance of the building and elevator. Excellent location just in front of Canal St Martin.